Whoa-ho-hoaaa. This Spicy Sausage Rigatoni + a smooth glass of Barefoot Rich Red Blend is my newest, bestest friend. You guysss. We are super-excited to have today’s post sponsored by our wine brand of choice: Barefoot Wine! Barefoot is and always has been one of my favorite wines, because it’s so super accessible, affordable, and as I’ve only said a million and one times, actually tastes good. Mind: blown. And while I am partial to the Malbec, this lovely, new-to-me Rich Red Blend is a force to be reckoned with: “jammy and rich with lots of black fruit. Sweet vanilla aromas and spicy flavors complement the smooth, lingering finish.” Gosh. Twist my arm. I think you know that I do love my vegetables, which is convenient since there are actually two good sources of veggies in this recipe (FOR REAL), but all the good veggie things aside, there are some times when you just need to find a way to get some spicy Italian sausage in your life. And if that spicy Italian sausage can come in tandem with finely minced golden brown sautéed onions and carrots, red pepper flakes, oregano, and a splash of Barefoot Rich Red Blend all swimming in the magic that is San Marzano tomatoes and served on whole wheat rigatoni with FRESH BASIL RIBBONS (summer, you’re a gem) and Parmesan to infinity and beyond? Well, then, do we even need to keep talking? Last weekend, while my parents enjoyed a weekend getaway and Bjork and I went back “home” and watched my siblings aka let them do whatever they wanted (just kidding, mom and dad, juuust kidding), we brought Sage with us for a little weekend adventure. This is one of the many perks of being raised in a dog-loving family: bring the dog! give her lots of dog treats! don’t mind the bad breath and mass amounts of shedding! But the thing is, my parents have two dogs (King Charles Cavalier Spaniels, anyone?) and the boys are basically just two old dog-men who do whatever they want and sleep wherever they want and basically live for the singular goal of naps and hoarding treats. The boys warmly welcomed Sage into the new pack, and Sage was like, meh. Whatever, guys. One night we went to go pick up pizza, because, well, what else? It’s small town Minnesota on a Saturday night. And on the way out the door, in a really weird, poor, brain-off decision making moment, we decided to bring the dogs with for a pizza joy ride. ALL THREE OF THEM. Do I even need to tell you that we had taken the car to get cleaned, um, THAT DAY? No. We’re just that obvious with life. Everyone had a great time looking out the windows and shedding insane amounts on our freshly cleaned backseat (did I mention that already?) and sniffing at the pizza, except our Baby Princess, our Precious Girl Sage. I feel like this is the moment where you realize your child is the un-fun, dead-head whiny one who lacks the Have a Good Time gene, but the child is actually a dog, and you somehow still think it’s kind of the cutest, most hilarious thing ever. Would this be considered slapstick dog humor? We are so there. Sage is so funny about food – while my parents’ dogs will go wild for annnnnything food-related with a rabid vengeance (including pizza! ), Sage turns her nose up. UNLESS. Unless there is meat, and that includes her new interest – spicy Italian sausage. There have been a handful of meat recipes around this blog lately (steak mac and cheese, for example? ), and Sage has taken notice. 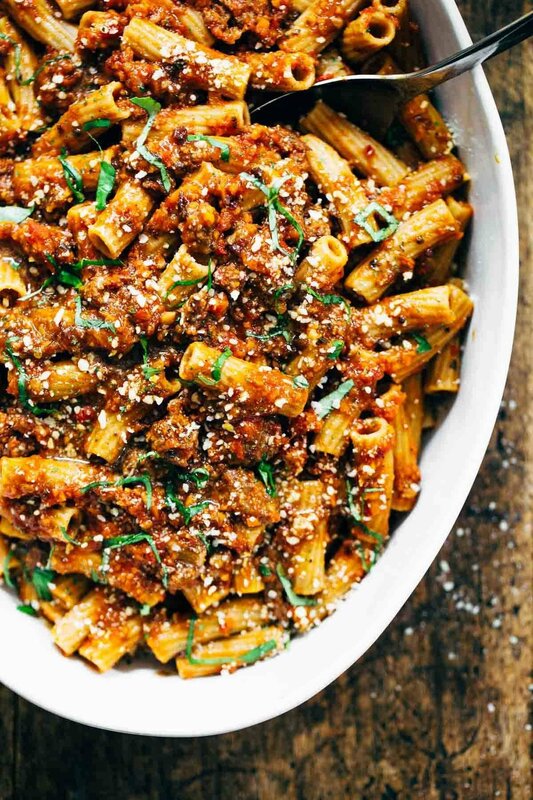 It kind of runs in the family – not necessarily the love of meat, but the love of this Spicy Sausage Rigatoni. Bjork was a big big big fan, and me too – probably because this is the kind of meal that reminds both of us of all those yummy, simple, comforting, post-sports-practice meals we had growing up that were best eaten with a simple green salad and a glass of milk. Minnesota born and raised, yo! You guys. We’re bringing the spice to small town Minnesota! My family, Bjork, me, and Sagey Girl all approve. Now I’ve filled up a plate for you, so bring me your wine glass and that bottle of Barefoot’s Rich Red Blend and we’ll be all set to let the good meal vibes roll. Spicy Sausage Rigatoni – my whole family LOVES this recipe! Real food ingredients like whole wheat rigatoni, San Marzano tomatoes, and red wine. Heat the oil in a skillet over medium high heat. Add the onion and carrots – saute for 10 minutes or so, until the vegetables are very soft. Add the ground sausage, oregano, red pepper flakes, salt, and pepper. When the sausage is fully cooked, add the wine to get the browned bits off the bottom of the pan. Add the tomatoes and dressing – simmer for 10-20 minutes while the pasta is cooking. Cook the pasta according to package directions. When draining, reserve 1/2 cup of the cooking water. Combine the pasta, the sauce, and the reserved water and toss gently to combine. Transfer to a large serving dish and top with Parmesan and parsley or basil. Serve with more Barefoot Rich Red Blend! Thank you again to Barefoot for sponsoring this post! And guys. You can thank them by treating yourself to a bottle of their Rich Red Blend. WIN WIN WIN WIN WINNNN. OH my gosh that picture of Sage… too funny! As a meaty meaty man, I say AMEN to that! Thanks Sam! Glad you like the Sagey pic! I’ll take it….both the pasta dish and the glass of wine! This looks like my type of meal…mmmmm! Thanks Kathy! You and me both. I’m a fan of anything spicy and red blend wine, so this meal is totally up my ally. That photo of Sage is priceless! Thanks Ana! We love our little goofy girl. Thanks Mary! Hope you like it! So funny. I seriously think Sage is part cat – she’s such a snuggler, sometimes I feel like I can almost hear her purring. Rigatoni is one of my favorite comfort dishes. And cooking with wine oooobviously means I get to drink it too, right? Winning! This is the kind of food that screams “comfort” food — and with the wine pairing! SCORE!! Totally in love with this! YUM. Thanks! 🙂 Hope you like it! I’m with the parents pup – if there is food, I’m automatically in Drool Mode. And if you add wine to the mix, I will be parked right at the table wagging my imaginary tail. Especially this pasta!! I just want to dive head first into that bit pot of pasta! This recipe is total comfort food. I have definitely added it to my must make list. Comfort food indeed! Thanks Chelsea! What a great dinner combination, both sound so good! The recipe looks great, but don’t you think it is a little misleading to show the nutritional stats for this meal serving TEN. There is no way you could serve this as a meal to 10 people, it would be a few tablespoons per person. Great recipe, but there’s no reason to hide that a pasta dinner is more than 300 calories a serving. YUM! There’s nothing I love more than a delicious, hearty pasta. I want this for lunch!! I’m loving these pictures so much! Haha – Sage sounds like a hoot and a holler! My younger dog will eat anything – even cardboard, but my older dog is picky – no pineapple, no blackberries, carrots – only if they are cut right! Doggie Food Snob is what we call her! That’s the perfect term for Sage! 🙂 Doggie Food Snob! I laughed so hard, Lindsay, with your description of your parents’ dogs! I have an old 11-year-old Cavi myself, and she is exactly like that! -> “…basically just two old dog-men who do whatever they want and sleep wherever they want and basically live for the singular goal of naps and hoarding treats.” And that picture of Sage was so funny; thanks for sharing!! Thanks Hannah! 🙂 Gotta love our senior cavs! Whoa ho hoaa is right Lindsay! This looks so delicious! Right up my alley…Italian food and spicy! Weirdly, I am just drinking a (rather early) glass of Barefoot Merlot. How coincidental is that?!! It was on special recently at my local Waitrose supermarket, in London, and I have totally fallen for it so bought 6 bottles. It’s so smooth and easy to drink! I am a massive foodie (see my blog, Flair Fairy, on my website http://www.angelabuntcreative.com) which contains my favourite recipes. I am a Kiwi but I lived in Italy for 10 years (2 years in Sicily and 8 in Piemonte). This recipe resonates with my Sicilian years (my ex husband is Sicilian) – tomato, garlic, basil based with delicious Sicilian sausage with fennel seeds. Rigatoni is one of my favourite pastas as I like large pasta and a sauce that is not too wet. 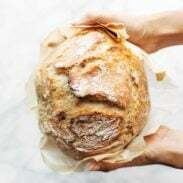 Thank you for sharing this recipe; it made me nostalgic for those years I spent in Sicily where my older son was born and I have some of my best memories. I should have added some fennel seeds here! Love that! And I fell in love with Waitrose products when we were in the Philippines, oddly enough… it was my favorite brand at our local grocery store. 🙂 So glad you love Barefoot, too! Your princess is so cute. Dogs really are so funny, aren’t they? 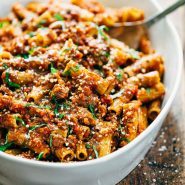 And this rigatoni recipe looks so good. I’m loving the wine pairing too. This looks SO yum!!! Can’t wait to make it. Pinning!!! I have a thing for spicy pasta! This one looks incredible. Pinning! Awesome! I hope you like it Jen! Bah ha ha! 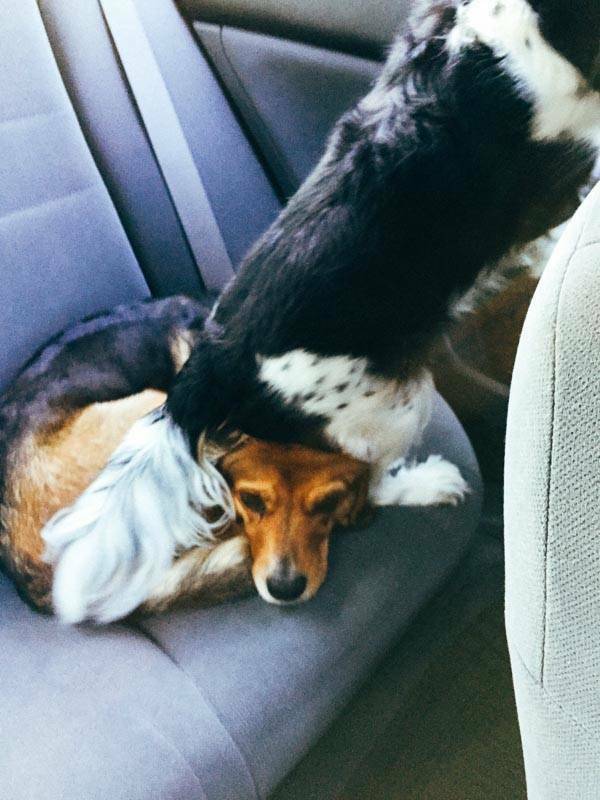 “I wish your bum wasn’t on my head, King Charles, but I can’t seem to care enough to move.” Bless her heart. Also, I love, and I mean LOVE really thick meat sauce on noodles. I’m saving this recipe. Thanks! Beautiful color in that dish. I love spicy meat sauces. I know you said it’s optional but I would totally add balsamic to it. I bet that adds a lot of great flavor. Thanks for sharing the recipe!